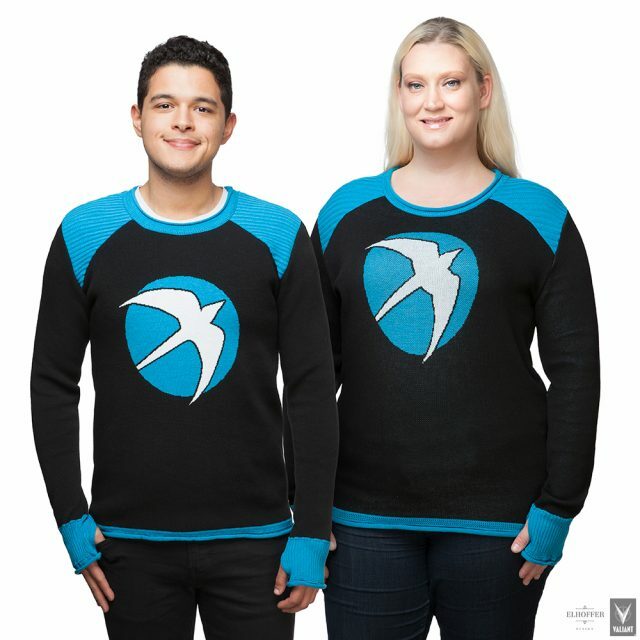 Debuting today exclusively at ThinkGeek, Valiant Entertainment and Elhoffer Design are proud to unveil a new fashion-forward line of women’s and unisex apparel inspired by Valiant’s internationally renowned, breakout superhero sensation, Faith, and her allies on the Harbinger team of super-powered teenagers. Faith will soon fly onto the big screen alongside her teammates in a HARBINGER feature film from Sony Pictures and produced by Neal Mortiz’s Original Film (The Fast & The Furious franchise). To shop “The Faith Collection” today, visit ThinkGeek here. Elhoffer Design was founded by Catherine Elhoffer in 2016 after she worked for years for others in the geek fashion world and as a costume designer in Hollywood. She started by crafting every piece she sold with her own hands, but quickly expanded to working with small factories in Los Angeles to make small runs and limited quantities. She oversees new designs and still often makes the first samples to ensure the design is perfect. Flattering curvy bodies and putting pockets in as much as possible are her two major rules when designing, with the goal of empowering all women to feel amazing when going out to conquer the world.